I'm in need of advice as my metal working skills are very basic (almost non existent would be even more appropriate . I'd like the pommel of this dagger below (pict 2) to match my A Crecy pommel (pict 1). I'm sure it is fairly easy to achieve with the proper tools (basically I'd just like to hollow the borders on both sides). I have a dremel, but even with the coarsest of my wheels I've barely scratched the surface...I'm thinking of buying a little benchtop belt sander. Would that be appropriate for that kind of job? (most seem too big to shape such fine details...). I'm looking forward to hear your advices. it'll depend on the steel. if it's a mild steel, you're probably ok. if it's hardened carbon, I think the technical term for what you're wanting is "rather you than me". and a dremel's likely to do pretty limited work. they're only dinky things, after all. from there, are you able to get the pommel off? if so, you're probably more likely to be able to work it well. if not, then the grip is going to get in the way a hell of a lot, and likely to end up a mess. once you've filed the basic concave profile to shape with the files, the smooth file should have given a slightly scruffy satin finish, I'd then use a split dowel clamp of a matching diameter to the filed profile, with emery paper in it, and work up from P120 to P240, P400, P600, P1000 or P1200 then P1200 wet, then onto a Jeweller's micron paper by hand, and polish the peice up to a mirror finish that way. 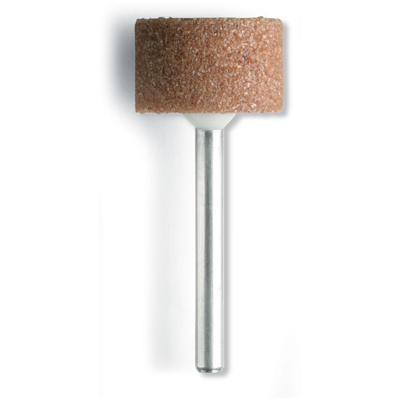 I've used the aluminum oxide Dremel grinding bits to reshape Windlass pommels and crosses. They worked well for me. Faster than a file, but not so fast that it can get away from you. They come in different shapes and sizes (see link below). The ones I think you'd want are cylindrical, and in 1/8", 3/8" and 5/8" sizes. You could also use a round file, either primarily or as a later step in finishing. Some advice. A good wheel size without excessive wear, when cruising at a peripheral speed of 30-33 meters per second. Here the formula for calculating the number of revolutions per minute rel diameter of the wheel. Here is an example. N = speed (60 x 1000 x 30): (15 x 3.14) = 38,000 rpm. I think the Dremel is running at max 30,000. This means that using a grinding wheel of 10 mm is not convenient for the grinding wheel wear. One other thing, an electric grinder discs, can remove excess material, then finish with the Dremel. 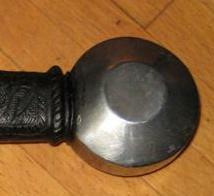 The pommel, are typically medium carbon content, not heat treated. And you probably already know this, but do wear a dust mask and goggles. Better still, get one of those headhand arrangements with the pivoting clear face protector. I have often had Dremel cutoff wheels or sanding drums break and fly apart. Just curious: How would a pommel such as this be hot-worked in a period fashion? There's not that much to grab onto. http://www.myArmoury.com/talk/viewtopic.php?t...ighlight=) but the balance is nonsense (the pommel used is the same as the MLR coustille, with a blade only half the lenght...so the point of balance is at the middle of the grip...the natural motion to strike would be to hammer your foe with the pommel, as the blade presence is simply non existent. In short, removing a lot of mass off the pommel makes perfect sense, and the knife should benefit from that aesthetically too). ...but the balance is nonsense (the pommel used is the same as the MLR coustille, with a blade only half the lenght...so the point of balance is at the middle of the grip...the natural motion to strike would be to hammer your foe with the pommel, as the blade presence is simply non existent. haha yeah I'm looking for a small spherical pommel for the same reason. I bought the dagger because i loved how it looked with the big wheel pommel, so I hope this works out for you. I find that stacking a number of cutting wheels together slows down how deeply they cut at each pass making for greater control and the stacked wheels support each other a bit so they don't turn to dust as easily. What the cutting wheels really don't like is any side pressure when trying to cut anything but in a strait line. I like the cutting wheels as the abrasive really cuts aggressively while the other stones used on dremel tool heads just don't seem very effective on steel of any hardness. The cutting wheel are like a Star Wars light sabre when used as intended to cut of a section off steel, they also work great for doing decorative file work but one can easily muck up the work if one's hand isn't 100% steady and in control as well the rotation of the wheel can take you further or deeper than you want to go.